Summer is gone in the blink of an eye. Each day flew by so quickly. I have to use my time wisely. If one’s lifetime were represented in one day, I would be at about 2pm right now. I still have plenty of time to do a few things before going to bed. This analogy served as a good reminder to number my days. I would like to be a faithful and wise steward, listening to what God asks me to do. This summer, JCFN-US had an intern from Moody Bible institute. Her major is pastoral care and emphasizing on women's ministry. One of her internship requirements was to plan a women's retreat. 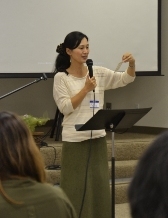 On July 20th, JCFN had our first one-day women's retreat. There were over 40 attendees ranging in age from their 20's to 70's. During the retreat, we had a time of stillness and meditated on each one's spiritual journey after an inspirational testimony. It was a truly spiritual and a fruitful moment, way beyond our expectations. "During the meditation, I realized for the first time that I was angry towards God because of what I had been through. I feel like I found the key to solve my spiritual struggle now. I want to take this seriously and tackle with God." "I thought it was coincidence for me to come to this retreat but it was not true. I was so blessed. Now I really need to pray for my future step." Overall, the retreat seemed to serve the attendees by allowing them the opportunity to face God and prompt them to take the next step. Many said, "please host this kind of retreat annually." Though we are unsure as to host any future retreats, but I thank God for this opportunity for us to see the potential for a new ministry. In the last few years, I have set out four goals for myself. These are: 1) Ministry for moms in the Irvine area, 2) Mentoring young people and students, 3) Organizing resource material for the returnees, and 4) To be in ministry as a couple. I had been involved in goals #1-3, but we finally started #4 this summer. We invited students from our church to our home for a six-series Bible study. We studied "Sermon on the Mount" together, which also is the theme for Equipper Conference this year. "Who will cook for them?" "Who will take care of the kids during the Bible study?" These were some of the concerns that I had but God took care of them and we successfully completed all six lessons. During that time, I had the privilege to have a one-on-one evangelistic Bible study with a girl who was a short-term exchange student. I was so blessed. We are seeking for the Lord's will on how we can develop this ministry as a couple. Please pray for us. 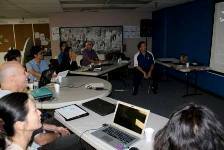 During the end of summer, we participated in a one-day Partnership Development Seminar. We learned practical ways on how to develop ministry supporters. I personally liked the principles they presented as we drew financial issues from the Bible. Both ministers and supporters need to be equipped as a disciple of the Lord and we all need to experience God's abundant provision through giving. While taking this seminar, I was reminded of the love and support I continuously receive from all of you. Each of you have been giving faithfully and praying for me. I thank you so much. 1.Growth for those with whom we follow-up. Pray that amidst the Japanese culture, church, family, and other varying issues, these believers may remain connected to God, and that a Christian community will be provided for each one of them. 2.Please pray that the Lord will send new people to Mommy & Me class. Also, please pray for blessings on the one-on-one bible study for a new believer, and mentoring with college students. 3.Please pray that the Lord will meet my financial needs. This fiscal year, my financial goal is raised to $1600 /month and currently 68.1% has been met. As a matter of fact, my support has been dropped for the past 12 months. Please pray for God's provision. Also, not only for me, but as JCFN whole, we have been facing financial challenges. Please pray for this in order to promote God's work. 4.We are working on translating a devotion guide for returnees. I thank God that we have enough volunteers. Please pray that it will be completed by the end of December so that we will be able to distribute it to returnees. 5.Please pray that I can be a faithful servant, holding onto the calling from God as a minister, wife and mother. 6.Please pray for my home church, Takatsuki Evangelical Free Church. Thank you very much for your prayers. God bless you all! !